It must be genetic. Southern women collect traditions like some people do stamps. Even our recipes come with genealogies. No conversation passes without clarification of the antecedents of those whose names pass through the discussion. We are a people for whom our sense of place in time and history is important. People, recipes, and houses have histories and to us they go to create the wonderful tapestry of who we are. Those new to the South are sometimes offended by our questions. One of the first questions any newcomer is asked is "What church do you belong to?" This question isn’t to challenge one’s morality, it’s a place question. A who do you know that I know question. It is the jumping off point for sharing information about people known in common. From that point the conversation may begin…not to talk politics or religion…too dangerous! But to talk people. Porches were once the gathering place for people talk. Some folks call it gossip. It is too ingrained within the Southern tradition to be belittled by such a derogatory term. Southern talk is more in the tradition of the seanachies of old Ireland. The seanachie was the historian of the tribe who passed the oral history of the tribe down from one generation to another. The Irish and their descendant Scots settled the South. The pub, the community gathering place in the old land, became the front porch where people would sit in the shade, drink tea sweet as syrup, and wait for someone to walk by and join them…to share the "news", meaning the talk of what was happening in the lives of those they knew in common. I sometimes think a part of the loneliness and alienation young and old alike now feel is due in part to the fact that air conditioning keeps folks inside. I wonder if the bars on the windows would be necessary if the sense of community developed on those front porches continued today. A community was like a family. Each contributed to the security of the least of them because caring was not abdicated to a government agency, but was a responsibility of those who kept up with the "news" about their neighbors. As a young mother, it became important to establish traditions for my children as they were set for me. I started jotted things down for my children to find if suddenly I were taken from them. My horror was that they would be lost without the security of knowing what their Grandmother’s favorite foods were, who their people were, where they came from…how they fit in the world. Only a child’s mother can provide them with that unique and special sense of who they are. To a Southerner, genealogy is not a hobby; it is a sacred trust. Who we are, why we are here in this place, and what is our purpose, has meaning beyond our simple existence. We are one in a chain, a continuation of a heritage. Not to know our heritage is to dishonor those to whom honor meant everything. Like the seanachies of our Irish heritage, every generation produces one who remembers and records. We pass the torch to another generation to lift the eyes, the spirits, the ambitions of the children to aspire to lofty goals and transmit the same character and purpose to the next generation. "Then gather around this sacred spot, when the flowers sweeten the air, and the song of the birds makes melody with the children that cluster around you, and tell them the story of their fathers and brothers. Teach them that man is noblest when he died for man, and that their fathers were heroes and patriots worthy of the admiration of the world." The family information I have acquired, including all those pictures that tell such a story in themselves, are too precious not to share. Since our family gatherings revolve around food, what better way to discover our ancestors than around those wonderful dishes we would have shared with them if they were here with us. Perhaps my children’s eyes will not glaze over with family history presented in this manner. Courage came to me from the height of the mountain and with it came the dignity of manhood, and knowledge of the Tree of Life, for now I was a branch, running with the vital blood, waiting in the darkness of the Garden for some unknown Eve to tempt me with the apple of her beauty, that we might know our nakedness, and bring forth sons and daughter to magnify the Lord our God. I saw behind me those who had gone, and before me, those who are to come. I looked back and saw my father, and his father, and all our fathers, and in front, to see my son and his son, and the sons upon sons beyond. As I felt, so they had felt, and were to feel, as then, so now, as tomorrow and forever. Then I was not afraid, for I was in a long line that had no beginning, and no end, and the hand of his father grasped my father's hand, and the hand was in mine, and my unborn son took my right hand, and all, up and down the line that stretched from Time That Was, to Time That Is, and Is Not Yet raised their hands to show the link, and we found that we were one, born of Woman, Son of Man, had in the Image, fashioned in the Womb by Will of God, the Eternal Father." These bits and pieces would never have come together in this book without the inspiration of the Lunch Bunch, my reminder not to let this fast paced world deprive me of the gift of Friendship. Faith, family, friends and freedom are the most treasured commodities to Southern women. All of our creativity revolves around nurturing these basics of life. Tastes, sounds, and smells accompany our traditions. Suddenly, in the middle of Manhattan, the smell of fried chicken can take me back to Grandmother’s house and Sunday dinner at Wakefield. In the South, gatherings of family and friends always center around food. 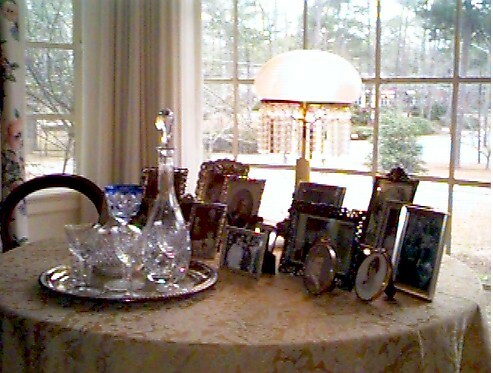 The purpose of this web site is to share the people, the places, and the traditions of one Southern family.